Purdy High School Athletic Hall of Fame member Mike Payne welcomes 2018 inductee Nancy Easter to the Hall and presents her a commemorative plaque. The Purdy R-II School District celebrated its annual Homecoming on Friday, February 9. Purdy High School junior Emma Harkey was crowned queen in a special coronation ceremony held between JV and Varsity basketball games versus McAuley. Harkey is the daughter of Sam Harkey and Amy Harkey. The queen was radiant in a two-piece gown, featuring a white bodice and a blue and white print skirt. She was heralded into the gym by crownbearer Bryson Terry, son of Spencer and Shelby Terry, and flower girl Pacie Utter, daughter of Coy and Carrie Utter. Harkey was accompanied by attendants Bayleigh Robbins, daughter of Cecil and Jennifer Robbins; Shana Whisman, daughter of Shane Whisman and Denise Hembree and granddaughter of Lynn Whisman; and Emma Mareth, daughter of Ed and Julia Mareth. The Purdy High School Student Council, sponsored by faculty members Tabitha Farris and Lacey Nelson, and the Purdy High School Future Business Leaders of America (FBLA), sponsored by faculty members Kay Wright and Ashley Brown, organized a series of special dress days reflecting the 2018 Homecoming theme, Moana, including Traffic Light Day, Disney Day and Beach Day. The 2018 Homecoming and FBLA Week culminated in the coronation of the year’s Mr. Tip-Off at a special assembly on Friday. Senior Kole Rea, son of Kevin Rea and Brandon and Jennifer Rose, was crowned by Purdy High School Cheer Squad Co-Captains Emily Webb and Emma Mareth. Rea’s fellow candidates included Osiel Aldava, son of Andres and Norma Aldava; Harley Stephens, son of Jamie Roller and Michael Stephens; and Kyler Propps, son of Kevin and Mica Propps. Following the coronation, the Tip-Off and Homecoming Queen candidates competed in a series of fun-filled games, including a live version of Hungry Hippos. 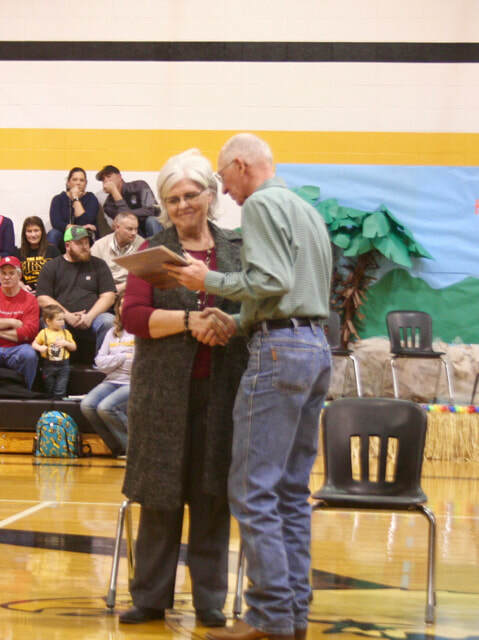 Prior to the Homecoming Coronation, the district inducted former Purdy High School Volleyball Coach Nancy Easter into its Athletic Hall of Fame. Easter became the seventh member of the Hall, joining the late Norman “Gabby” Gibbons, the late Earl Miller, Becky (Fly) Woods, Mike Payne, Megan Leonard and Brenda (Keeling) McNeil. Member Becky (Fly) Woods welcomed Easter to the Hall, as Member Mike Payne presented her with a commemorative plaque. Easter was joined on the floor by daughter Jenny (Easter) Cofield and son Jody Easter, as well as several of her former Purdy High School Volleyball Players. A reception, featuring a memorabilia display and multimedia presentation, was held in the commons area throughout the night. 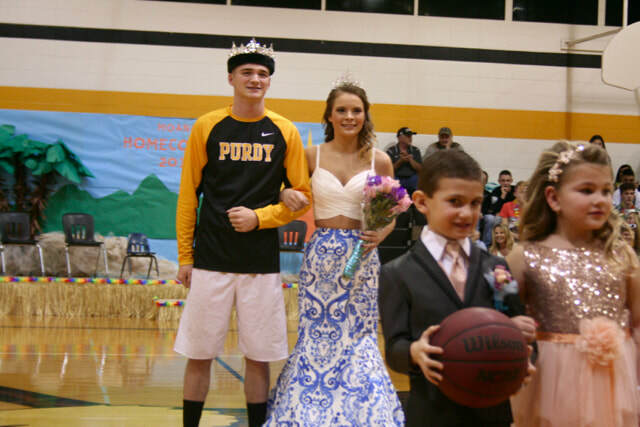 2018 Purdy High School Mr. Tip-Off Kole Rea, son of Kevin Rea and Brandon and Jennifer Rose, and Queen Emma Harkey, daughter of Sam Harkey and Emma Harkey, are presented by Crownbearer Bryson Terry, son of Spencer and Shelby Terry, and Flower Girl Pacie Utter, daughter of Coy and Carrie Utter.